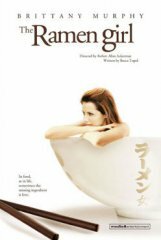 The Ramen Girl staring Brittany Murphy is Media 8 Entertainment’s latest straight to DVD release about an American woman (Murphy) who searches for direction in life and decides to become a ramen chef under a tyrannical Japanese master. As ridiculous as this premise may seem, in all sincerity, it is no more outrageous or unbelievable than a movie about a Jamaican bob sledding team. This however, does not excuse it from falling short at every possible opportunity it gets and being painfully mediocre and forgettable. The story unfolds with Abby moving to Japan to be with her hot-shot web designer of a boyfriend who abruptly abandons her after a night of reconnecting. Distraught and left stranded in a culture foreign and strange to her, she wanders into a nearby ramen shop and hysterically pours her frustrations out to the perplexed couple that runs it. Despite the language barrier and being completely at loss, the couple decides to take pity on the “crazy white girl” by comforting her with a bowl of ramen and some kindness. She returns to thank the couple the next day and experiences an epiphany after witnesses the magical healing effects of the shop’s ramen. Without any real explanation, Abby comes to the conclusion that it is her destiny to become a ramen chef. She then pesters the shop’s often drunk and moody Japanese master chef Maezumi (Toshiyuki Nishida) to teach her all there is to the art of making ramen. Reluctantly, he accepts and thus begins a comedic and contentious relationship of trials and tribulation where she ultimately learns that the secret to a good bowl of ramen is more than just the ingredients. Being belittled and learning the art of Ramen aside, there are also several random subplots and characters in the film such as Abby’s English speaking friends from a night club, the returning Ramen shop patron infatuated with Abby, to the Korean Japanese gentlemen, Toshi Iwamoto (Sohee Park). Iwamoto eventually becomes Abby’s new love interest but fails to develop any real romantic or believable onscreen chemistry. All the characters and subplots were interesting and contributed briefly to the story, but for the large part they were unexplored and never truly materialize or even concluded. At best, they were shallow fillers and at worse, insignificant — ultimately contributing to the film’s many shortcomings. The film’s most noticeable flaw was perhaps its inability to capture the idiosyncrasies and essences of the Japanese culture — something the film, “Lost in Translations,” did so well. Not much was said or scripted to take advantage of the uniqueness and beauty of the Japanese culture. In fact, Abby could have been stranded in New Orleans and wanted to become a gumbo chef and it would have played out the same. It’s especially bad when I have to admit that I had a better feel for the Japanese culture by listening to the commentaries and watching the Japanese team in the World Baseball Classics than by watching this film. Additionally, The Ramen Girl is also guilty of breaking a cardinal rule when it comes to food movies. And that is, you always show the food and never tease the audience. It is almost inexcusable and extremely disappointing to watch a movie about ramen only to catch quick glimpses and flashes of delicious ramen goodness. I would have liked to have seen more ramen screen time, or at least more scenes of Maezumi teaching Abby how to actually make and prepare it. Ironically, for a story where Maezumi berates and belittles Abby about the importance of heart and not having any, The Ramen Girl is guilty of the same. It is essentially a shallow time waster that bills itself as a romantic comedy without the romance or really any comedy. Hats off however to many of the actors who did a good job, especially Tsutomu Yamazaki who played the apathetic and lethargic Ramen Grand Master and Murphy as her usual perky and precocious self. While ramen in Japan is an entire meal with a universe in itself, “The Ramen Girl” is more like the cheap instant noodle of the west similar in name only. If you’re a fan of Murphy and want to kill some time, “The Ramen Girl” is perfectly enjoyable as it does have its moments. If you’re looking for a good ramen story, however, look elsewhere — preferably Juzo Itami’s memorable Japanese classic, Tampopo, which most likely inspired this film*. *The Ramen Girl IS NOT a remake of Tampopo as many bloggers would like to assume.